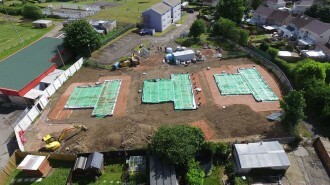 Work is well underway at Bron Afon Community Housing’s Ty Rosser Gwyn scheme – an exciting new development which forms part of the Welsh Government’s Innovative Housing Programme. RPA have been appointed as employer’s agent and are currently working closely with both Bron Afon and the main contractor – ENGIE, in order to ensure the project is delivered on time and within budget. Method 1: Modcell – uses renewable, locally sourced, carbon sequestering materials (straw and hemp) to create a negative carbon construction system. Method 2: Wikihouse – a timber frame system that is made from locally sourced timber, again providing a material that sequesters carbon. Method 3: SIPS – a timber-based system, providing carbon negative build by sequestering carbon in the core material. The project arose out of a need to trial new housing models and methods of delivery as a response to the increasing challenges faced by young people who are unable to access affordable housing. The scheme is due for completion in early 2019.